After receiving a dual degree in engineering and business at the University of Pennsylvania, Ken Goldberg went on to receive his PhD in computer science from Carnegie Mellon University, writing his dissertation on stochastic plans for robotic manipulation. In his artwork Goldberg uses his extensive background in computers and engineering to overturn stereotypes of dehumanization and the impersonal often given to the field of technology. His work spans from a live garden tended by a robot, which is controlled by devotees on the internet, to a 1/1 millionth scale model of Frank Lloyd Wright’s Fallingwater, fabricated from silicon, to a film about the history of Jewish assimilation in 20th-century America, and Barbie. Goldberg’s projects have been exhibited at the Whitney Biennial, Venice Biennale, Pompidou Center (Paris), Walker Art Center, Ars Electronica (Linz Austria), ZKM (Karlsruhe), ICC Biennale (Tokyo), Kwangju Biennale (Seoul), Artists Space, and The Kitchen (New York). He is Founding Director of Berkeley’s Art, Technology, and Culture Colloquium and has held visiting positions at San Francisco Art Institute, MIT Media Lab, and Pasadena Art Center. Goldberg was awarded the National Science Foundation Young Investigator Award in 1994, the NSF Presidential Faculty Fellowship in 1995, the Joseph Engelberger Robotics Award in 2000, the IEEE Major Educational Innovation Award in 2001. In addition to being an artist, Goldberg is a professor of Engineering at UC Berkeley, where he is currently Director of the Berkeley Center for New Media. This year Goldberg’s work will be featured in Bloom, a group exhibition at Nevada Art Museum. 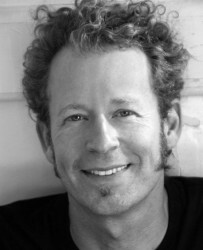 Goldberg currently lives in Mill Valley and has exhibited with Catharine Clark Gallery since 1995.